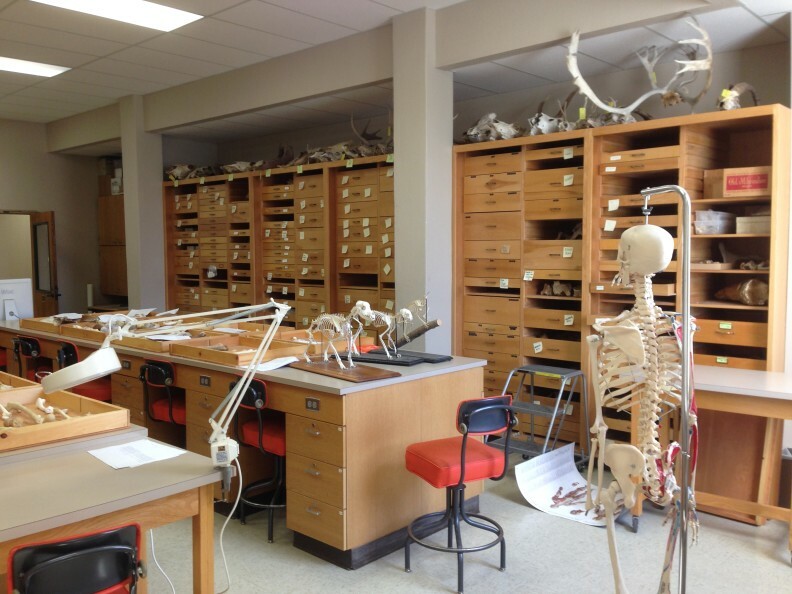 The zooarchaeology reference collection and associated lab facilities are located in College Hall 205, a large lab and workspace designed to facilitate the analysis of skeletal material from archaeological and paleontological contexts. The zooarchaeology lab holds a large collection of modern, paleontological, archaeological and replicated skeletal material. Western North American animals, both coastal and marine, are represented. We also have some replica human material and human evolution casts. Electronic catalogs of these collections are updated regularly and can be accessed upon request. We are more than happy to help you gain access to the materials you need either remotely or on location; please email for more information and to arrange access. Most active research occurring in the lab is being undertaken by Dr. Colin Grier as part of his on-going research on the Northwest Coast of North America. Graduate students working under Dr. Grier’s supervision also are actively using the collection. From time to time, help with managing and updating the collections is needed. WSU anthropology undergraduates in particular are encouraged to contact Colin Grier, the lab director if you would like to volunteer your time in the lab.